Baguettes, cinnamon rolls and filled pastries impeccably arranged for breakfast while passengers eagerly awaited their selections to be served. Having a passion for bread and all that it evokes, I laid eyes on a tapered baguette, pulled it toward me and pressed down on the lightly browned crust to hear it crackle. Tearing an end off, I took one bite of its delicate inside texture, intoxicating aroma and chewy crust and gladly proclaimed it was freshly made. Now the pastries piqued my taste buds; they proved to be layers of flaky and buttery perfection and so delightful with a cup of hot coffee. I had to ask: Who is the pastry chef on this cruise ship? Making my way to the concierge, she arranged for me to meet the pastry chef the next day between breakfast and lunch. Knowing the volumes of meals ship’s restaurants prepare and serve with exact timing and scheduling, I made sure to be on time to the main dining room. I took a seat at one of the tables dressed with crisp white table linens and was careful not to disturb the place setting. Soon, I was introduced to Executive Pastry Chef Rafael De Freitas, who was wearing a tall and folded chef’s toque hat. He seemed calm for a chef who churns out hundreds of baked goods a day. Chef told me his baking career began in his home country of South Africa and he knew from a young age that baking was his calling. 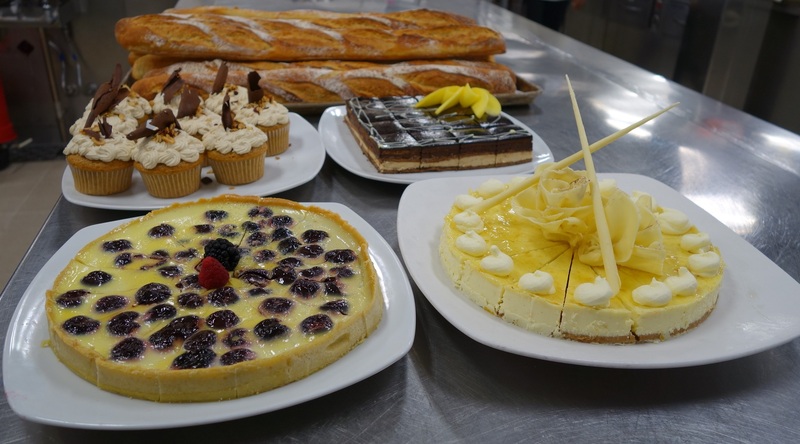 In the early years, Chef De Freitas spent many hours learning to bake varieties of breads in a Portuguese bakery and then taught himself to make cakes. He loved the artistry of creating each item so much so that he eagerly taught others the secrets to baking while living in Mozambique. Baking had definitely become his passion. The more experience he gained in kitchens, the more he realized he needed to be well rounded in his professional vocation. He moved to Cape Town and attended City and Guilds culinary school, concentrating on even more precise pastry knowledge. As his culinary journey progressed, he honed his skills in fine dining establishments and upscale hotels, preparing assortments of breads and elegant desserts. His notable desserts were even requested for prominent diplomats. Longing to see the world, he joined the cruise ship industry and appreciates his staff and position with Regent Seven Seas Cruise line. The draw for him was that the bakery items are not outsourced and he is able to order the best ingredients. His eyes lit up as he expressed how he is able to use his creativity for baking every day and ensure the quality is not compromised. Being a curious bread baker myself, I inquired which type of flour is used for the baguettes. Chef said it is the finest flour from France because it makes the perfect loaf. He also explained that the kitchen is used seven days a week, round the clock, and that timing is imperative in making the breads. Using his hands to demonstrate, he explained how the dough is made with flour, salt, water and yeast. A commercial-size mixer with a dough hook kneads the huge amount of dough; the next step is the process of slow proofing. Like a baby, the dough must rest. The heap of dough is formed in baguette pans and placed in steam ovens until the lightly browned crust appears. Nearly 60 baguettes a day are made each day for the 490 passengers. The wheat bread and salted twisted rolls then use the coveted oven space. Chef invited me into the ship’s galley and what I noticed in addition to the irresistible aromas of fresh baking, was how orderly and clean the work areas were. Also impressive were all the equipment and tools, ready to turn out hundreds of desserts and breads throughout day. Like a well-oiled machine, the bustling crew in their assigned positions rolled out dough, blended chocolate with cream to the right consistency and put finishing touches on elegant cakes and tarts. In just a few short hours, tonight’s dining guests would have a splendid array of desserts. Because Chef is the ultimate taste tester for all the products, he adheres to a rigorous fitness schedule to compensate for all the goodies. He is determined his trained palate will not get the best of his waistline. When Chef De Freitas is not baking on the ship, he’s back home with his wife and two daughters, cooking for them. He also devotes time to writing his recipe book, Modern African Desserts and dreaming of sweet creations.